The novel includes a lot of material on secret societies, descendents of Jesus, secret rituals, visual codes embedded in Leonardo Da Vinci's paintings, etc. This makes for a great story. Our concern is mainly in those passages where author Dan Brown deals in depth with the history of the first few centuries of Christianity. Much of this material is concentrated in Chapter 55 to 60, Pages 230 to 259 of his book. He includes many historical "facts" which are not true, and others that are based on speculation. Beliefs of religious conservatives: Most believe that the Bible's authors were directly inspired by God to write material that was without error. They regard the genealogies of Jesus, which appear in the gospels written by Matthew and Luke, to be factually correct. They do differ, and thus have to be harmonized. The number of generations are very different. Luke's genealogy appears to be Joseph's, which would seem to negate the virgin birth. However, they both agree that David and Solomon were ancestors of Jesus. According to this belief system, Brown is merely stating facts. Beliefs of religious liberals and historians: Many believe that the authors of the Christian Scriptures (New Testament) wrote with one eye on the Old Testament in order to show how all of the passages in the Hebrew Scriptures (Old Testament) that could possibly be made to refer to Jesus were fulfilled. Since the Hebrew Scriptures talked about an anointed one who would come in the future as a political/military/theological power and gain freedom for Israel, the Christian Scriptures had to reflect those predictions. The Hebrew Scriptures talked about the coming anointed one being a descendent of King David. Thus, Jesus' life had to fulfill this prophecy. The anonymous author of the Gospel of Luke invented a genealogy for Jesus to fulfill the predictions of the Old Testament. Some theologians and very early Christian writers believe that the original copies of the Gospel of Matthew did not incorporate sections on Jesus' genealogy and nativity; the first two chapters were written later by an unknown forger, include his or her beliefs about Jesus' ancestry, and were attached as a prefix to the original gospel. 5 The result is two different fictional genealogies which cannot be harmonized. By the first century CE, Jews' detailed ancestry would have been unknown. The structure of 12 Jewish tribes had largely disappeared. When the Assyrians conquered and annexed large portions of Israel in 732 BCE, the Northern Kingdom ceased to exist. Nine tribes were deported; their Jewish identity was forever lost. Foreigners were brought in to settle the land, which was renamed as Samaria. When the Babylonians under Nebuchadnezzar conquered the Southern Kingdom of Judah in 597 and 586 BCE, many Hebrews were taken into exile; few returned. People in first century CE Palestine had largely lost their tribal identity and information on their ancestry. According to the beliefs of many liberals, the genealogies in Matthew and Luke are pure speculation written to make Jesus life appear to fulfill prophecies in the Hebrew Scriptures. Jesus was, in all probability, not the descendent of David. Thus, Brown is simply repeating the speculation of the two gospels. Page 231: Not factual: Jesus "...life was recorded by thousands of followers across the land." Jesus didn't have thousands of followers during his lifetime. The Gospel writers described in detail about a dozen of his close supporters who apparently traveled with him. About half were male and half female. He preached to thousands of people; however, few could be considered to be his followers. "...the total literacy rate in the Land of Israel at that time (of Jews only, of course), was probably less than 3%." 2 A brief mention of Jesus' life as recorded by the Jewish historian Josephus has survived. A few dozen gospels of Jesus have been found -- either writings referred to by Christian writers in the second and later centuries CE, or full texts, partial texts, or fragments. But the probability of thousands of followers each keeping a record of Jesus sayings and acts is vanishingly small. Page 231: Not factual: "More than eighty gospels were considered for the New Testament and yet only a relative few were chosen for inclusion -- Matthew, Mark, Luke and John..." There are only about 40 known gospels for which full copies remain, or parts of their text exist, or references have been made in other surviving writings. Page 232: Not factual: Constantine was a Pagan all of his life and was only baptized into Christianity on his death bed and then only because he was too weak to resist. Constantine actually converted from Paganism to Christianity in 312 CE after a vision on the battlefield. It is true that he was not baptized until just before his death. Many Christians did this, thinking it was safer. Baptism was believed to have magic powers: it wiped away all sin. By waiting until the end of life to be baptized, one could lead a life on sin and have everything forgiven. The suggestion that he didn't want to be baptized seems very doubtful. He was probably anxious to be baptized in order to obtain forgiveness of his sins. Page 232-3: Not factual: "...Constantine shifted [the Christian Sabbath from Saturday to Sunday] to coincide with the pagan's veneration day of the sun." In reality, Constantine merely declared that Sunday was to be a day of rest throughout the entire Roman Empire. Sunday did not formally become the Christian Sabbath until the Church Council of Laodicea circa 364 CE ordered that religious observances were to be conducted on Sunday, not Saturday. Their motivation was largely anti-Judaic. They ruled: "Christians shall not Judaize and be idle on Saturday, but shall work on that day." Page 233: Not factual: Brown states that at the Council of Nicea in 325 CE, "Jesus was viewed by his followers as a mortal prophet...a great and powerful man, but a man nonetheless. A mortal." This was true of the early Jewish Christians who regarded Jesus as a prophet, rejected the virgin birth and deity of Jesus, and considered Paul a heretic. But by the second century CE, Christianity was divided among those who regarded Jesus as a man, or as a pure God, or as a god-man. Long before the time of Nicea, the third position had won out and most Christians regarded Jesus as a god-man. Page 234: Not factual: "Constantine commissioned and financed a new Bible, which omitted those gospels that spoke of Christ's human traits and embellished those gospels that made him godlike." Constantine did commission the creation of 50 copies of the Bible. However, by that time, the four gospels had long been accepted as part of the Christian Scriptures. The Synoptic gospels (Mark, Matthew, Luke) all describe Jesus as having many dozens of very human traits. He exhibited: hunger, anger, impatience, racism and other emotions. He bled and died. Page 234: Not factual: "Fortunately for historians...some of the gospels that Constantine attempted to eradicate managed to survive. The Dead Sea Scrolls were found in the 1950s hidden in a cave near Qumran in the Judean desert...these documents speak of Christ's ministry in very human terms." The Dead Sea Scrolls were actually found in the 1940s. The Dead Sea Scrolls contained no gospels. The scrolls contained no Christian writings at all; they were entirely made up of Jewish documents. Page 245: Not factual: "...Jesus was a Jew...and the social decorum during that time virtually forbid a Jewish man to be unmarried." The Essenes -- one of the major Jewish traditions during Jesus lifetime -- required its men to be unmarried. Page 245: Not factual: "These are photocopies of the Nag Hammadi and Dead Sea scrolls...The earliest Christian records." The Dead Sea scrolls contain no Christian material. They consist of copies of books from the Hebrew Scriptures (Old Testament.) The Nag Hammadi scrolls are Gnostic Christian material that were written after the earliest Christian records were written. Page 245: Speculative: Dan Brown implies that the Gospel of Mary Magdalene was actually written by Mary Magdalene. The consensus of religious historians is that none of the Gnostic writings -- Gospels and Acts -- are written by the people to whom they are attributed. Page 248: Not factual: Mary Magdalene is identified as being of the House of Benjamin. Her family tree is known. In reality, nothing at all is known of Mary's tribe or family tree. Priory of Sion: Throughout the book, the Priory of Sion is described as a secret society that is dedicated to keeping the marriage and bloodline of Jesus and Mary Magdalene secret. Brown makes references to parchments found in the Biblioth'que National in Paris. Actually, these documents and the Priory of Sion have been exposed as a 20th century hoax. Jesus' status: Brown asserts that Emperor Constantine in the early 4th century CE at the Council of Nicea changed Jesus' status from fully human to a deity. In reality, by 325 CE, the original Christian movement, the Jewish Christians who had regarded Jesus as a fully human prophet, had faded from the scene. Many of the Pauline Christians, who had evolved into proto-orthodox Christians, had accepted that Jesus was both God and human. Another large faction of Pauline Christians maintained that Jesus was fully human. The two sides were almost evenly matched. But Constantine threw his considerable political power on the side of Jesus being both God and man. The delegates agreed with him, and the rest is history. The book says that references to Mary's marriage to Jesus "kept recurring in the [four canonical] gospels." Actually, no such references exist. However, there are some events (the wedding at Cana, Mary's behavior at the grave site, an ungrounded teaching by the early Church that Mary Magdalene was a prostitute, etc.) which some theologians have been interpreted as supporting the possibility of their marriage. Brown refers to the marriage as a "matter of historical record." Actually, no such record exists. The Last Supper painting: Brown suggests that the individual to Jesus' right in the painting is a woman. In reality, it was the normal practice during the Renaissance to portray John, the beloved disciple, with long hair and without a beard. 6 Da Vinci's sketch of the angel Gabriel 7 and painting of John the Baptist 8 look very similar to the figure to Jesus' right in terms. All three have a rather effeminate face, long hair and lack of a beard. "Decoder Key," Christian Century, 2006-MAY-16. Page 23. Leonardo da Vinci's sketch of the angel Gabriel is at: http://altreligion.about.com/ Note: the bottom quarter of this sketch is not suitable for viewing by minors. 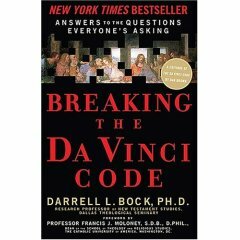 David Cloud, "The Da Vinci Code myth," Newsletter, Fundamental Baptist Information Service, 2006-AUG-01.